The Kosovo Security Force has its symbols, ranks and uniforms. These were selected and designed exclusively for the KSF, by national and international military experts on 12th December 2008. Emblems and ranks are worn on camouflaged uniforms, which were initially green and were donated by the United States of America and include a black beret. Article 15 of the Law on the Kosovo Security Force creates 9 ranks for KSF officers and 6 ranks for non-commissioned officers. 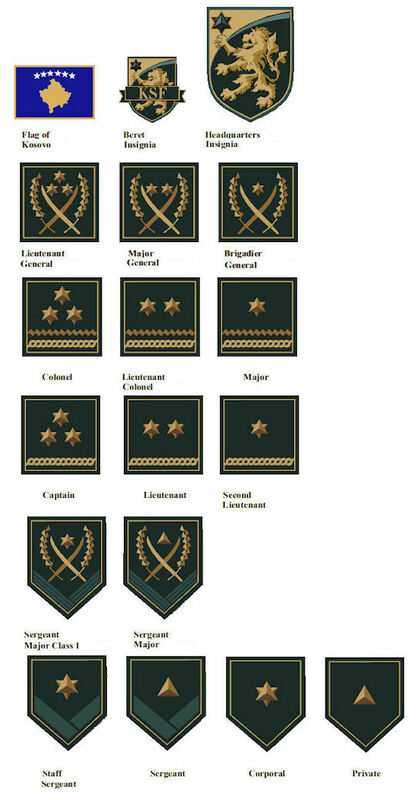 The officer ranks are: Lieutenant General, Major General, Brigadier General, Colonel, Lieutenant Colonel, Major, Lieutenant and Second Lieutenant. The other ranks are: Sergeant Major Class 1, Sergeant Major, Staff Sergeant, Sergeant, Corporal and Private. During the year 2012 the KSF even has searched and determined elements which identify values and continues to be build based upon highest standards of NATO but with national (local ) style and identity. It has already determined shape and design of symbols, ranks, uniforms which started to be wear on 27 November 2012 in honor of the KSF Day ), giving names to the barracks and units.